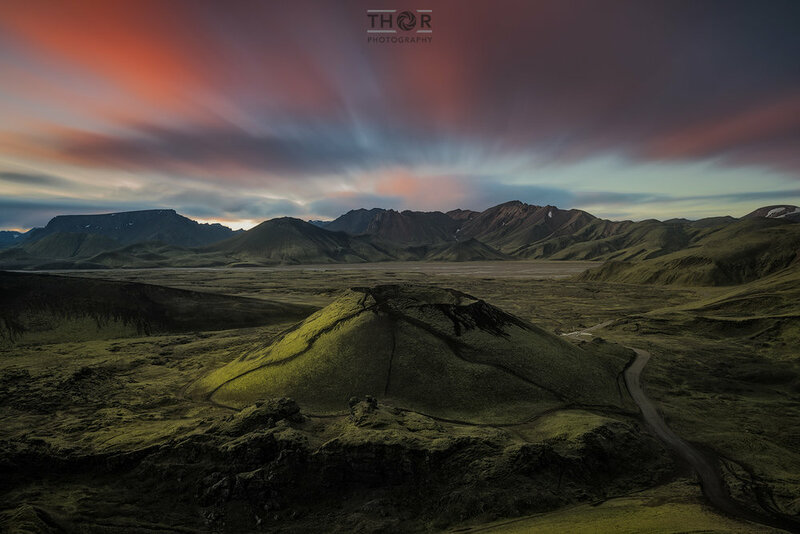 In August and September 2019, you can join Thorarinn Jonsson and Mike Mezeul II on a once-in-a-lifetime photography workshop into the Icelandic Highlands. The Best of both Worlds concept means this journey will take you to the pristine scenery of the unspoiled nature in the Icelandic Highlands, with the opportunity to see the Northern Lights since this time of year there will be enough darkness during the night for them to appear. It is a spectacular experience to witness the northern lights up there with not a single soul around you and no light pollution at all, that is if the conditions will allow us to see the lights. Whether we see the northern lights or not, prepare yourself for an overdose of natural beauty. From waterfalls to multi-colored mountains, iceberg filled lagoons, glass reflections in tidal pools and more. You will need to get your rest now because once you are immersed in Iceland, you won't want to sleep a wink! 9 Nights accommodation based upon double occupancy. Each room will have it's own private bathroom. Single supplement available for an additional $900 USD. All transportation within the workshop in a spacious 4x4 vehicle. All entrance fees to the parks we will be visiting. Access to our brains 24/7. We will be lodging at a variety of hotels throughout our stay. This workshop will include some moderate hikes on uneven ground and loose gravel. We will not take on any serious hikes but getting to a little bit of an elevated view in the Highlands is often quite rewarding with spectacular views. You will want to fly into the town of Keflavik, Iceland. From here, you will take a FlyBus to our host hotel (will be announced in our welcome email) in Reykjavik. The workshop will begin with our meet and greet at 6PM at the hotel restaurant on the 26th and wrap on the evening of the 3rd. The 4th will be your day to travel back home or to another destination. You're almost there! Just keep scrolling down and click the register icon. You will receive an invoice to sign up and that is when your $1500 non-refundable deposit is due. Your remaining balance will not be due until two months prior to our tour. What Is Our Itinerary Like? We will meet as a group at the hotel restaurant for our meet and greet. Here we will go over what to expect on our adventure and get to know one another. We will stay overnight in Reykjavik. The destination on this leg of the tour is the unspoiled nature of The Highlands. Hrauneyjar Hotel will be our base camp for the time we spend up in the Highlands. From there we will be travelling to several locations in the area, and as always, we base our shooting locations on the weather forecast and conditions at the time. On our way from Reykjavík to the Highlands we will stop at a few places.... Háifoss (Fourth tallest waterfall in Iceland with a drop of 122m) and Granni (situated right next to Háifoss). These are situated in Fossá, where both waterfalls drop side-by-side in a deep gorge. This is an exceptional place for photography where we encounter lava fields, jet black volcanic sands stretching for miles, mountains covered with bright green moss and colorful craters filled with water. The Highlands are covered in geothermal hotspots and previous volcanic activity is often evident.... a sure sign of the gigantic forces at work. Some are a few hundreds years in age and others only, just decades old. The best known location in The Highlands is probably Landmannalaugar where we will photograph colorful rhyolite mountains. This place is like nothing else you have ever seen before. In Landmannalaugar we have the option of do several short hikes into the Grænagil Canyon (green canyon) or even hike up to Brennisteinsalda which is a Sulphur mountain / hill. Also, there are good photo opportunities right from the parking area. This crater is also known as The Blue pool because of the color of the water. This 0.3 square km crater was formed during an explosive eruption about 1130 years ago. The colors here are simply breathtaking, with the red iron gravel inside the crater shining against the bright green vegetation surrounding the outside. This is the largest lake in the area covering roughly 2.2 square kms. With lava fields coming at it from 3 sides, this shows off the harsh forces at work in the eruptions that have formed this landscape. We will probably visit some of these places more than once. On our last day in The Highlands we will drive to a canyon called Eldgjá which holds a beautiful waterfall called Ófærufoss. We will photograph here before leaving the highlands and then we will set our course towards the Glacier lagoon. Along the way we have several stops to choose from based on time and conditions, places like: Fjaðrárgljúfur, Stjórnarfoss, Svínafellsjökull and more. We'll end our day in Glacier lagoon area. Glacier lagoon will be our playground, this is probably one of the most famous place in Iceland with its floating icebergs and just below the lagoon is the mystical diamond beach. On one of the days we are staying in this area we will go to Mt. Vestrahorn, a raw mountain with many composition options like sand dunes, reflection and waves. From the lagoon we start head our way west towards Vík where we will be photographing stunning seascapes, Dyrhólaey, Reynisdrangar and majestic waterfalls like Skógafoss and Seljalandsfoss among other things. This is our last day on the road and locations we have left on our itinerary are all about waterfalls, so have some lens clothes ready. The waterfalls are: the mighty Skógafoss, Seljalandsfoss, Kvernufoss and Gljúfrabúi. As always we have to go by the conditions and we might have a chance of shooting sunrise at Skógafoss before we go back for breakfast and checkout, then we will start to head our way to Reykjavík with stops mentioned above. Once we arrive in Reykjavik, we will check into our hotel and then meet downstairs before heading out for our farewell dinner.